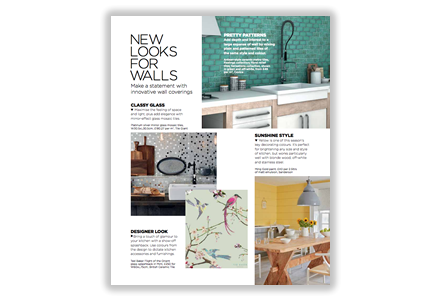 Don't just take our word that our tiles are the perfect addition to your wall and floor, we've been featured in several publications, displaying how well our tiles fit into any modern living environment. 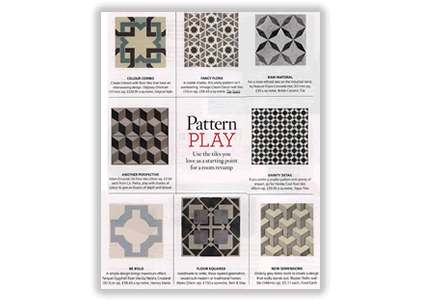 Below are a selection of clippings from publications where our tiles have been featured, in you're short of inspircation, this is the place for you. 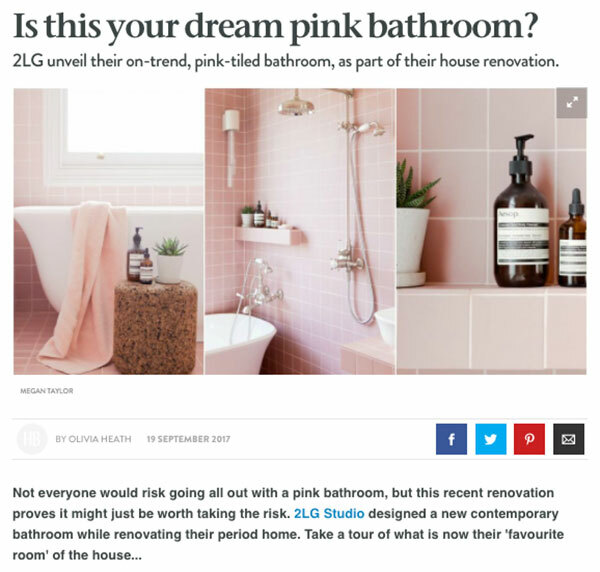 Pastel pink is hot right now and 2LG Studio just cranked it up a notch with their new bathroom renovation featuring our stunning Victorian Pink tiles. These porcelain tiles create a calm and relaxing environment transforming their bathroom into a beautiful sanctuary, perfect for relaxing in after a long day. 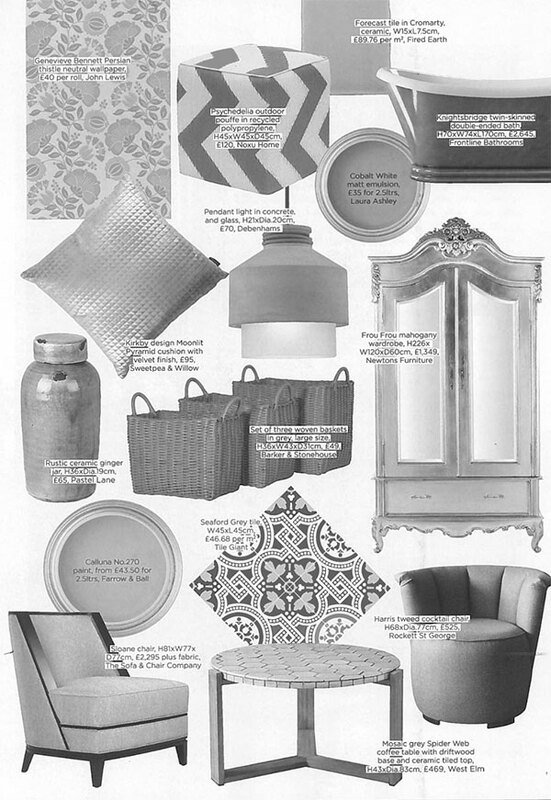 Real Homes has included our Platinum Silver Mirror tiles in a feature all about Platinum Grey. These beautiful glass mosaics are perfect for adding a little bit of sparkle to your interior design. Combine it with black and wooden home accessories to create the ultimate artisan look in your home. 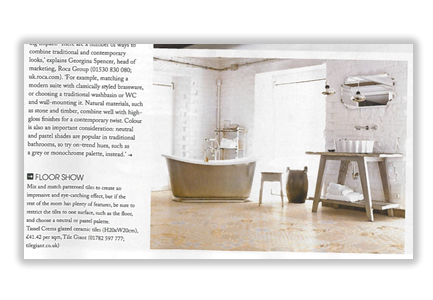 Also featured in Real Homes' Platinum Grey feature was our stunning Seaford Grey tile. These ceramic tiles have an added warmth of an underlying lilac that creates a clean-cut aesthetic in your home. 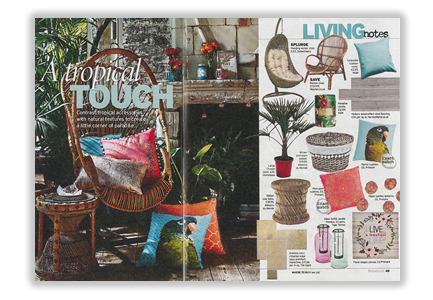 Combine with soft pastel coloured home accessories to add a pop of personality. These tiles are suitable for both the wall and the floor and have the versatility to work in any room in the home. 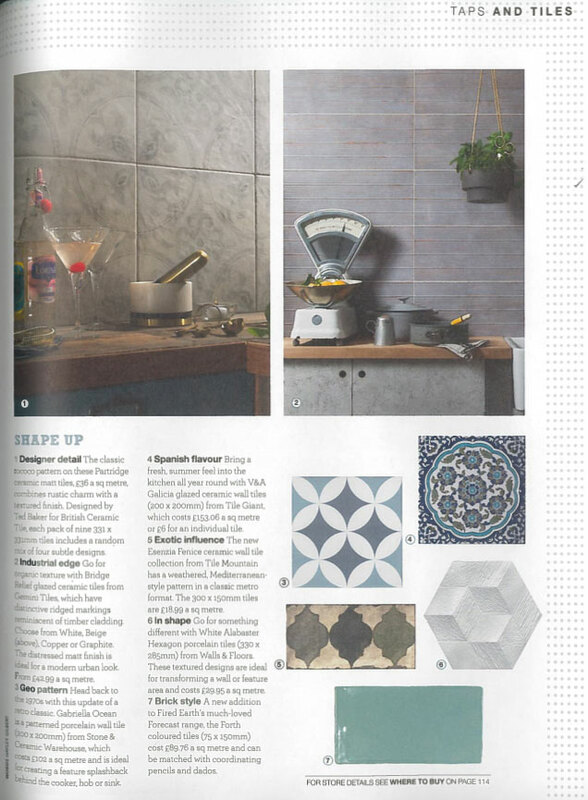 House Beautiful has recommended our designer V&A Galicia Decor tiles to add some Spanish flavour to your kitchen. A stunning ceramic tile that gives that fresh, Summer vibe all year long. Double whammy! 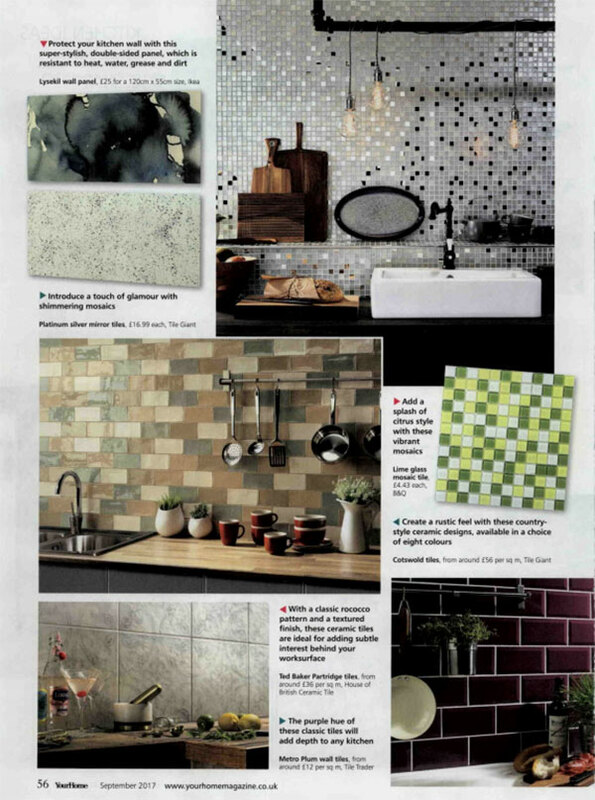 Your Home has featured us twice in their feature all about refreshing your kitchen with the latest tiles, using our Cotswold range and the Platinum Silver Mirror tiles. Two contrasting looks, both creating a statement look in the home. Get the look for less at Tile Giant. Our tiles offer excellent value for money and Good Homes knows it! Featuring the elegant Camargue range as an affordable alternative against another tile retailer. 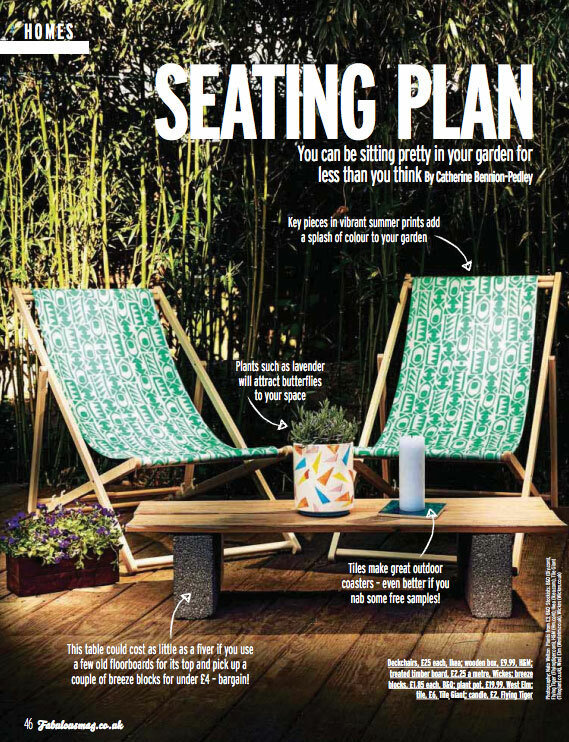 Up-cycling is big for 2017 and if you're on the look out for some inspiration - look no further. 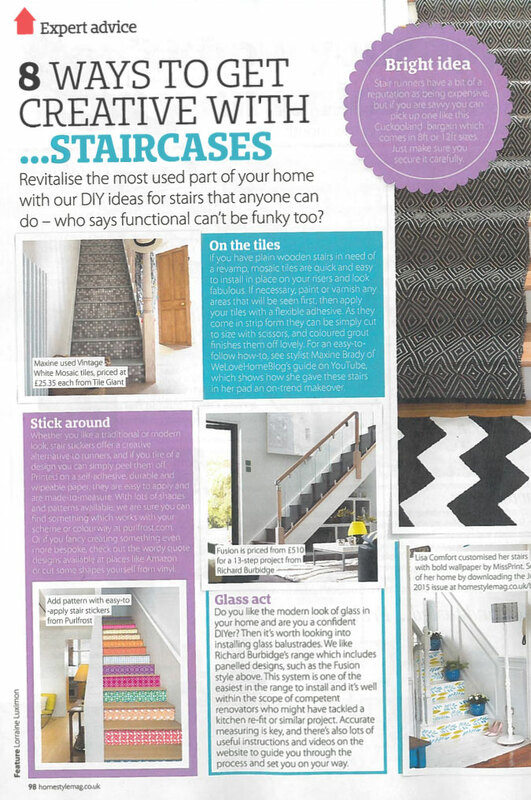 HomeStyle has featured our Vintage White Mosaic tiles as a way to get creative with your stairs. Simple and easy to install, these mosaics are the perfect choice if you want to get stuck into a DIY project of your own. 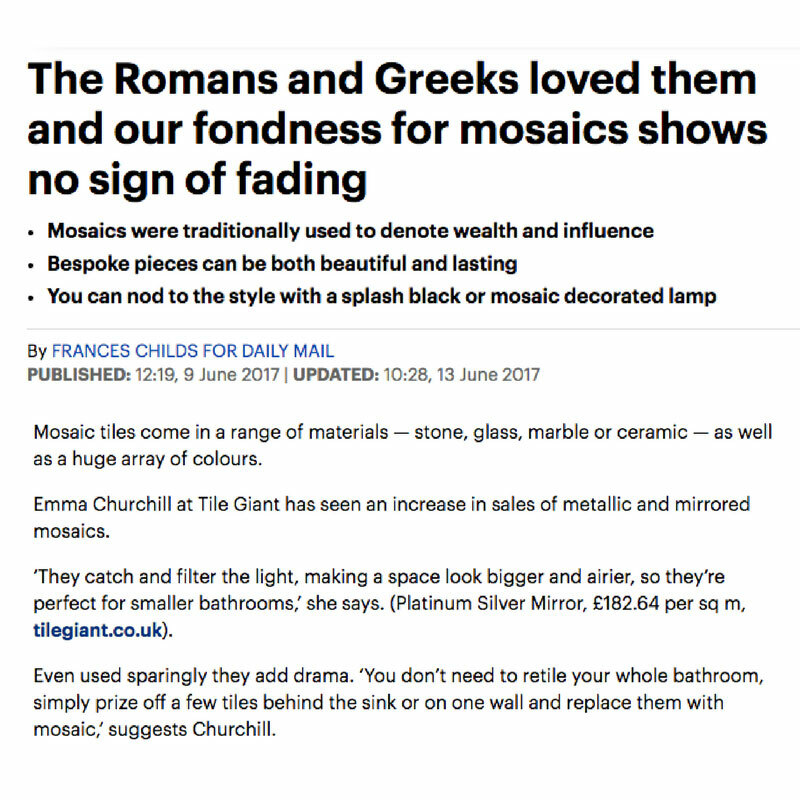 The Daily Mail has featured our beautiful sparkling Platinum Silver Mirror mosaics in a feature all about mosaics - a very popular choice of tile that shows no sign of slowing down. Mosaics are extremely versatile and can be used in most rooms in the home. The most popular use for mosaics is in the bathroom and kitchen where they can be used to create a colourful border in the bathroom or a splash-back in the kitchen, an easy way to create a statement look. The great thing about mosaics is that you only need to use them sparingly so they’re a perfect for those wanting to make an impact on a budget. 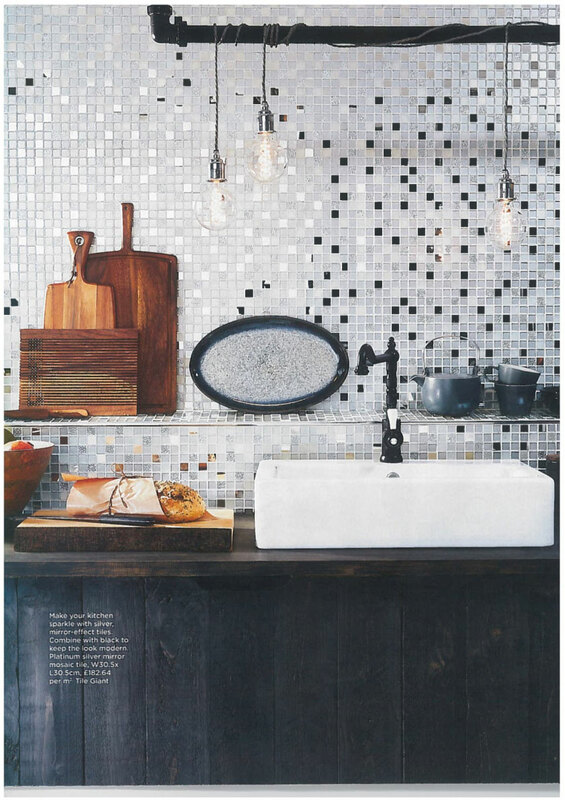 April’s edition of leading home interiors magazine, HomeStyle, has featured Tile Giant’s beautiful Platinum Silver Mirror mosaic as a bright idea of creating a fantastic splashback in a kitchen. It’s reflective surface brings light into the darkest of rooms and adds a luxurious finish to any wall - also looks wonderful as a bathroom splashback too. We love this product so much that we’ featured it as one of our coveted trends, Precious Metals. 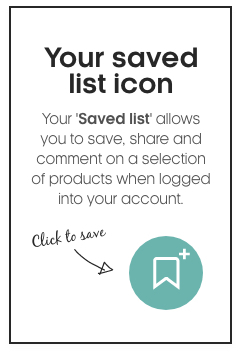 Find out more about our trends here. 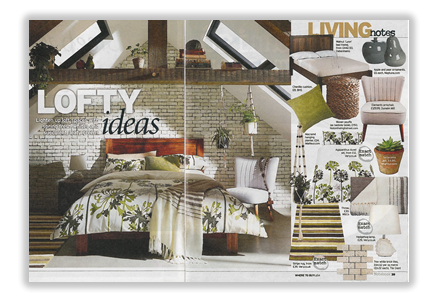 The Scotsman has named our Split-Face range in its 3rd May home interior trends feature. Split-Face is a rustic tile that is in-line with the latest architectural, interior design and lifestyle trends offering unique colours, textures and finishes. The trend for bringing the outdoor in is increasing and Split face natural slate provides the perfect solution for transforming interior walls to create the ultimate talking point within your home. It can be used around fireplaces to create stunning looks or transform living room walls into works of art. Kitchens and other living areas can be brought to life with this three dimensional stone mosaic. Find out more about our Greige trend here that features Split-Face in Oyster, available in eight other shades, including four sparkle shades that adds some extra luxury to this natural stone product. 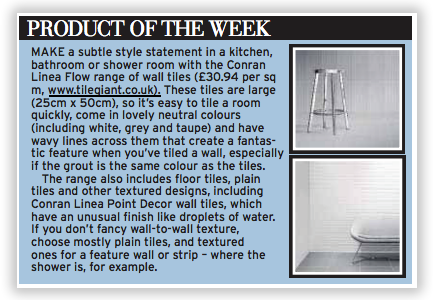 The Liverpool Echo has named our Conran Linea range of wall tiles as their product of the week (w/c 8 May 2017). These organic style tiles are complimented by warm and rich plain wall tiles to supply a clean backdrop to the decorative wall tiles. Studio Conran presents two distinctive ranges within the Linea Range itself. Linea Flow is available in five earthy shades and copies the distinct irregularity of hand drawn lines with its linear pattern. Linea Point is inspired by droplets of water on glass with the rich deep gloss glaze punctuates the satin finish of the tile. Our Studio Conran range forms part of our House of British Brands collection that celebrates inspirational homegrown design. Other brands featured in this collection are Laura Ashley and V&A, both bringing their very own distinctive style of British home inspiration to the collection. Store Manager Jordan Bailey presented the youngsters with their new kit, saying "Tile Giant likes to support the communities we work in. Abbeys Primary is on our doorstep and we know they do an amazing amount of good work both in the classroom and on the sports pitch." Everyone at Tile Giant is wishing Abbeys Primary School the best in all their sporting activities, and will be cheering them on. 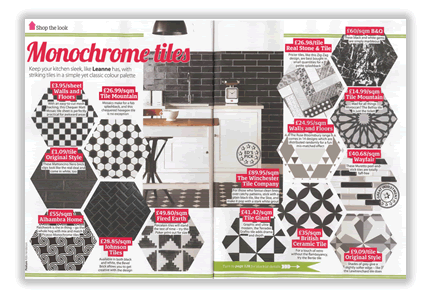 Making an appearance in Build It magazine in February 2017, the black Conran Hartland Pressed Mosaic tile was featured as one of the three best textured wall tiles on sale today! As part of the luxurious & stylish Studio Conran range at Tile Giant, this beautiful textured mosaic tile is just one of a fantastic range of sizes, colours and textures in the Conran range. Part of the fabulous House of British Brands range, featuring Laura Ashley and V&A, these tiles are perfect for creating a luxurious statement. 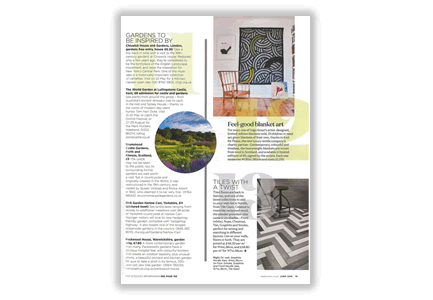 As featured in Living Etc in February 2017, the delightful Maori Goroka Grafito tile formed part of a feature on creating a stunning monochrome look in your home. Perfect for creating a bold pattern in any room of the home, the Maori Goroka range is ideal for making a stylish statement. Available in a range of colours, these patterned tiles go perfectly with the Etnia range of tiles. Helping to train the tilers of tomorrow, we're pleased to announce that every year we'll be donating our surplus stock, roughly 10,000 tiles, to the Walsall Construction Training Centre. This surplus stock will help 14-16 year olds get to grips with the types of products used when decorating an interior, and the wide variety of porcelain, ceramic and natural stone tiles on offer today. 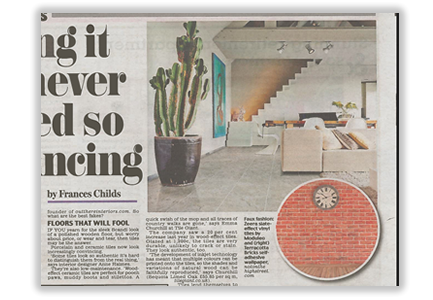 Speaking with the Daily Mail about 2017's hottest tiling trends, our very own Head of Marketing, Emma Churchill tipped a Moroccan-style interior as one of this year's biggest interior design trends. The wonderful Gredos patterned tile was singled out as one of the star tiles, with the beautiful, random pattern on this porcelain tile ideal for creating a stunning vintage effect with Moroccan-style undertones & a beautiful monochrome aesthetic. 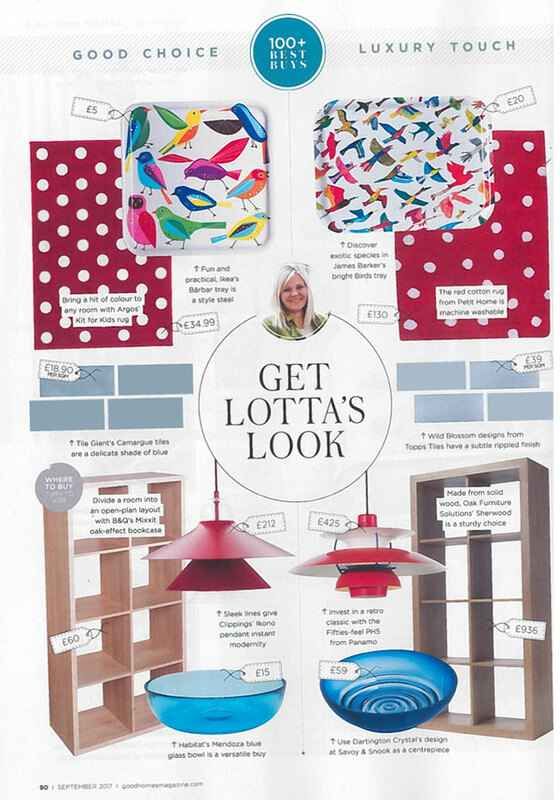 Making an appearance in Ideal Home magazine in January 2017, our Cotswold ceramic wall tiles were perfect for creating a contemporary look with a classic twist, and can be used in any room of the home to replicate that look. Using the Sage and Bone tiles, they created a sleek & stylish wall design. Looking for a classic look with a contemporary feel? Browse the Cotswold range now! 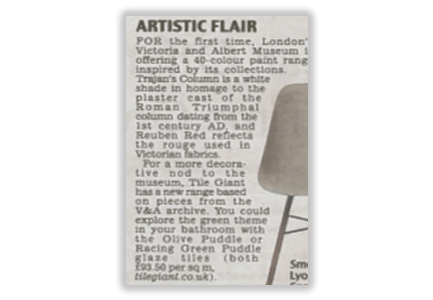 Picked as one of the trends for the new year, the V&A Puddle Glaze range was the star of the show in a feature by the Daily Mail in January 2017. Particularly recommending the Olive and Racing Green Puddle Glaze tiles, these tiles are perfect for adding a touch of artistic flair to any room, and a real sense of class and luxury on every wall and floor. Offering timeless style and a modern look and feel, the Sequoia Limed Oak porcelain tile made an appearance in the Daily Mail in January 2017. Perfect for creating a rustic look, but retaining the robust qualities of modern porcelain, these wood effect tiles have the versatility to add a touch of style to any room of the home, including kitchens, bathrooms, hallways, conservatories and lounges, ideal for use on both walls and floors, making these a great all-purpose tile, and the perfect addition to any modern living space. 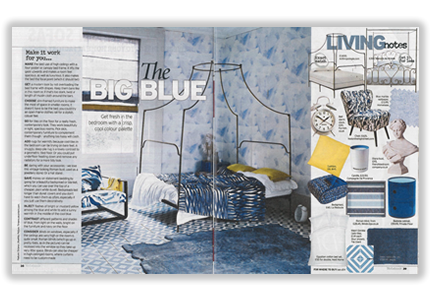 Featured in the Daily Mirror in April 2016, the beautiful Maori Goroka Ceilo porcelain floor and wall tile created a wonderfully stylish floor pattern in a true blue room design. But if blue isn’t your colour, the Maori Goroka tiles come in a range of colours, meaning you can mix and match to create a contemporary wall or floor design that really stands out. 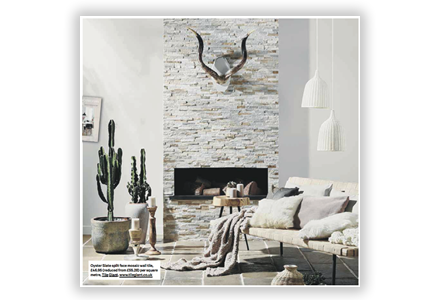 Perfect for creating a natural look with a warm, welcoming feel, the White Brick mosaic wall tile was the star of the show in the Daily Mirror in March 2016. This natural travertine mosaic is ideal for creating a rustic looking wall in any room of the home, complete with a natural unglazed texture. 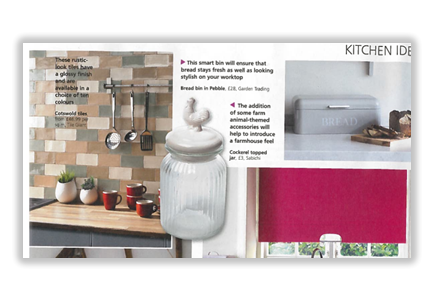 Helping to create a tropical feel in the Daily Mirror in May 2016, the Kremna Ivory Chisseled Edge Opus Premium Travertine tile is perfect for creating a natural, rustic feel in any kitchen or bathroom. The feel and look of natural stone allows this unglazed travertine tile to create a unique and beautiful look on your wall or floor. Creating a dramatic and modern look on any wall or floor, the Terrades Grafito ceramic tile made an appearance in Home Style in June 2016. Perfect for anyone looking to create a modern & stylish monochrome in their kitchen, bathroom, conservatory or hallway, the Terrades Grafito creates a sleek, stylish, yet simple look. 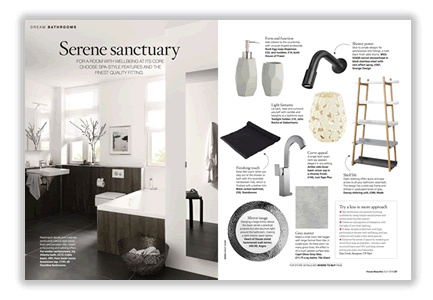 Creating a serene and calming atmosphere in House Beautiful magazine in May 2016, the Capri Grey Gloss ceramic tile produces a stylish look at a sensible price. The Capri range of tiles are part of Tile Giant’s Just the Job range, which offer high quality and even better value, as displayed as part of this beautiful roomset. Looking to create a vintage look on your walls? As featured in House Beautiful, the Vintage Cream Decor wall tile is perfect for anyone wanting to add a classical touch in their kitchen or bathroom. This glazed ceramic wall tile has a subtle texture to it, and is great for creating a Victorian-style look and feel in their home. As featured in Real Homes in June 2016, the Nordik range of wood effect tiles are on trend and highly stylish, perfect for creating a contemporary look on your walls and floors. With a choice of colours and sizes in the Nordik range, you can mix and match to create a natural wood effect floor with a modern look. 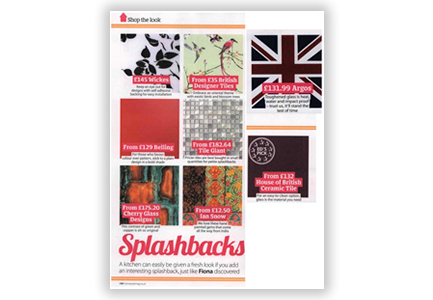 As featured in Real Homes in May 2016, the Mirror Effect glass mosaic tiles are perfect for creating an ultra-modern look on your walls, and really add the finishing touches to any room. When used on their own to create a stunning feature wall, or to add a beautiful border along any wall or floor, mosaics really add that extra something to any home. 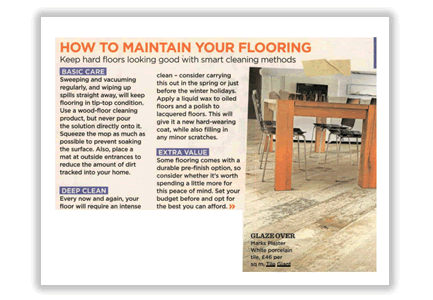 Creating a beautiful wood effect wall or floor, but offering the robust, durable qualities of porcelain, the Marks Plaster Porcelain tile made an appearance in Style at Home in March 2016, complete with some handy hints on keeping your tiles in tip top condition! 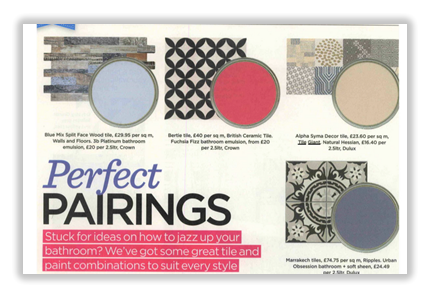 Mixing and matching tiles can create a design that makes a statement, as displayed here with the Tassel Crema glazed ceramic range in Grand Designs magazine. Perfect for creating a rustic look in any modern living space, a mixed linear pattern can really add something different to any wall or floor. As seen in Style at Home in August 2016, the Alpha Syma Decor porcelain patchwork tile is perfect for making a statement in any modern living space. 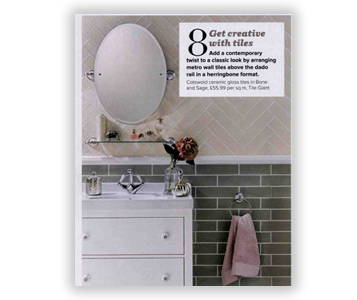 Paired with some delightful beige paint in this article, you can also use beige grout to allow these tiles to effortlessly fit onto any wall or floor. Perfect for creating a rustic look on any wall, the Costwold range featured in Your Home magazine in April 2016, demonstrating its versatility to create a rustic look in any modern living space, from a country kitchen to a city apartment, the Costwold range of ceramic wall tiles are perfect for creating a calm, neutral look with a rustic feel. A mosaic tile is perfect for adding the finishing touches to any wall or floor, or can be used to create a beautiful and eye-catching feature wall or splashback. 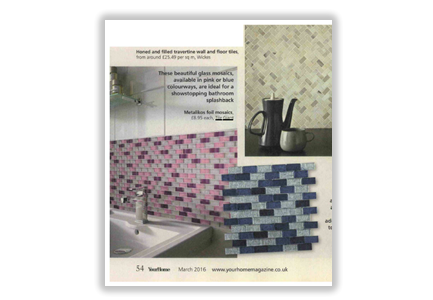 As demonstrated in Your Home magazine in February 2016, the pink and blue Metallikos foil mosaic tiles are perfect for adding a splash of colour to any room of the home.